How so, you ask? Well, on Five-Five-OH-Eight, FIU graduated 29 students from its program in China—the first graduates from an innovative partnership FIU has set up with the Chinese government. There are 1,000 students enrolled for the fall semester, and 500 to 600 of them will be working various positions on the Beijing Olympic Committee as members of the team managing the 500,000-plus visitors expected for the games. "We are the first and only program to have an international program of this caliber, where we designed the school, trained the professors and have a very successful enrollment," said Mohammed Qureshi, the school's assistant dean. It all started when Dean Joseph West was invited to a conference in China. He presented a paper that started the Chinese government's interest in the hospitality education at the international level. 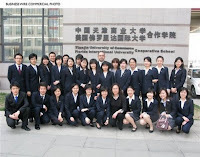 Three hospitality schools (FIU, Cornell and another school from Switzerland) were invited to form a partnership and offer a degree in Tianjin. FIU was awarded the partnership based on its proposal. The Chinese government funded the university's $50 million, 80-acre University Center that includes a 20 story dorm to house 1,000 students, teaching kitchens, computer centers and practice dining rooms. This a similar type of big-dollar deal that SEC college football programs have with their own universities (kidding! ... but not really). "This program was not to get ready for the Olympics, rather long-term planning to bring in more tourism in China and to meet the growing demands of hotels and restaurants and to be able to hire professional and properly trained managers."